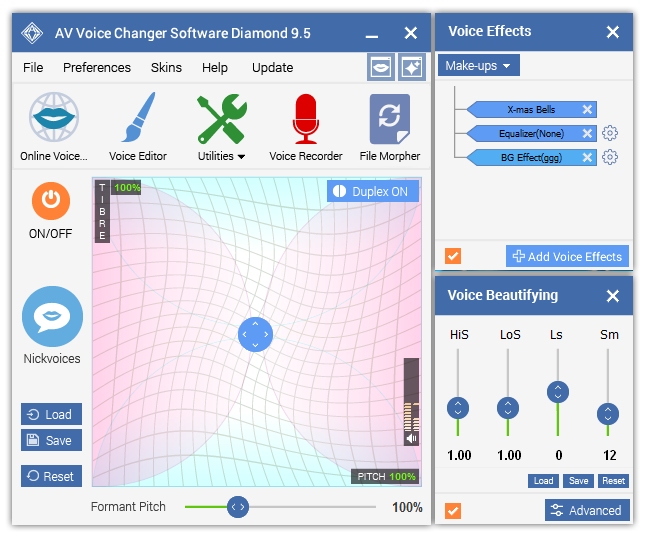 AV Voice Changer Software DIAMOND will allows you to chat in male, female, baby voice in voice chat rooms; keep your privacy and spy voice conference. Built-in MP3 player plays unchanged music while Voice Changer is morphing other audio streams. Recorder can record original, changed voice or morphed music and save in mp3, wma, wav, and other formats. Numerous plug-in effects and preset "nickvoices". Frequency Morpher, Advanced Tune, Equalizer, effect maker, "nickvoice" creator, update manager. It is easy to use, and it just works. Simple as that. I love this voice changer software, thanks! I'd like to say that this program is really amazing! The disguised voices are very convincing. It was definitely worth the money and I'll recommend this program to others. I am satisfied with what the program does,much better than some more expensive software. THIS IS VERY GOOD SOFTWARE . MAC OUTBACK ECHO SOUND EFFECT. Had to do emergency shutdown (pull de plug! )when it tried to blow my speakers and locked up the desktop. Tried it cause I like the features.